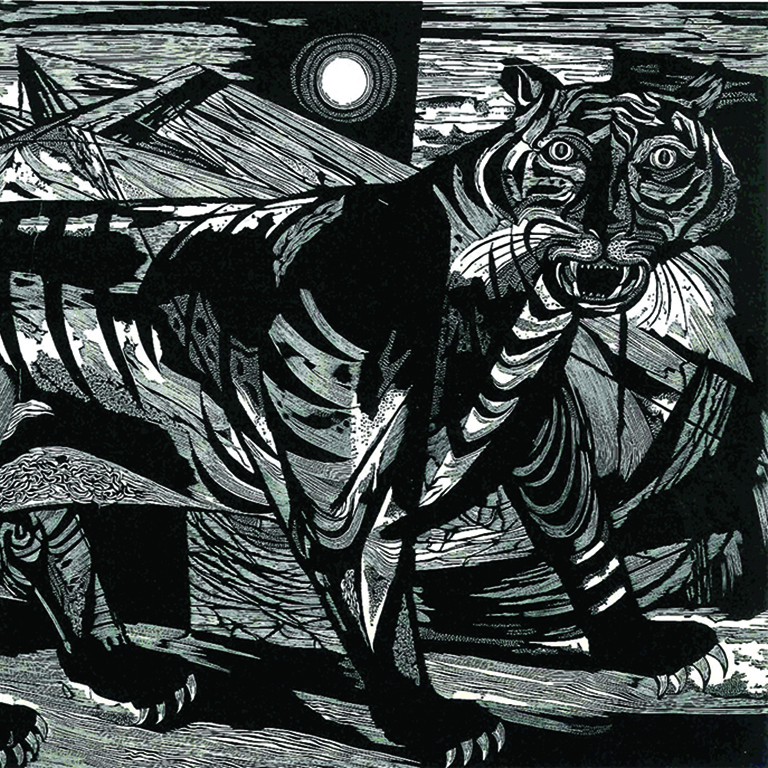 His prints, many of which were made using wood engravings, include tight, intricate lines that can be seen up close but create bold images from several feet away. Kohn’s early art career included time in Mexico, where he met and worked with several artists, including Jose Clemente Orosco and Diego Rivera. He spent time in Paris, Chicago and later in San Francisco. Kohn’s work was unique, said Jo Farb Hernández, curator for the IUK exhibit. His work was popular because of the scale, Farb Hernández said. Until Kohn, artists making prints were working on a much smaller scale, and the pieces could fit inside a book and were viewed mostly as a private experience, she said. Kohn took the art of print making and revolutionized it, spending months on intricate, large pieces. The exhibit at IUK is displayed in mostly chronological order, Farb Hernández said, starting with his early works and moving into his more experimental works, which includes a variety of media. There is a distinct shift in the style of his work, which marks his transition from Chicago to California. His work in the mid-1970s incorporated not only more color, but also handmade paper and strips of torn paper Kohn colored himself. He would incorporate etchings, engravings, wood blocks and a variety of other media in these pieces, Farb Hernández said. His pieces around this time were also much larger, which created a unique challenge for Kohn, Farb Hernández said. Presses at the time were not large enough to accommodate the size of Kohn’s large works, so he would have to press one side of a print, then take it out and flip it around to press the other side. It wasn’t a simple process, she said, because he would have to plan out and perfectly line up where one half of the print stopped and the other half began. His work continues to impress viewers, Farb Hernández said, because of the amount of detail and work Kohn put into each piece. Farb Hernández said she hopes visitors to the exhibit will leave with an appreciation for Kohn’s career. “We hope people will get a great understanding of the various print making techniques,” she said.